Predominantly fishing for estuary and surf species, at the Gold Coast Broadwater, Jumpinpin, Moreton Bay, Moreton Island and North and South Stradbroke Islands. Over the many years club fishing, I was Club Champion twice and was fortunate enough to represent South East Queensland and Queensland. I started lure fishing and hit Tournament scene with my best mate and fellow Frogleys Angler Chris Britton in 2004 and we were immediately hooked with some early success. It only seems like yesterday when I first hooked my first bream from underneath a pontoon. 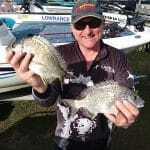 Some of the biggest changes I have witnessed the the Bream scene has been the quality of the gear we use. Frogley’s have had outstanding quality gear on hand for all of your applications for quite a number of years. If you see me one the water (actually you will probably hear me before you see me), don’t hesitate to come over and have a chat.